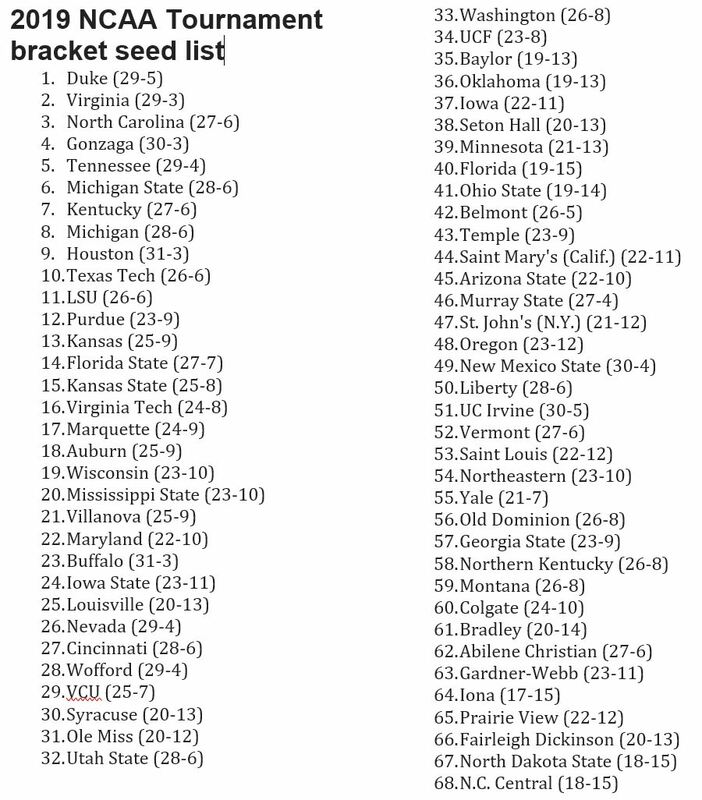 CERRITOS/SANTA BARBARA, CA (smt)- The Big Ten got 8 teams in but it was the ACC who was king as #1E-Duke (with sensation Zion (Williamson)), #1S-Virginia, and #1MW-North Carolina (record 17th #1 seed) got the top three #1 seeds. #1W-Gonzaga, despite losing to #11S-St. Mary’s in the WCC final, got the last #1 seed. The Cavs are back as a #1 seed a year after becoming the first team to lose to a #16 seed (no UMBC in sight this year). The top 32 ranked teams in the new NCAA Evaluation Tool (NET) made the tourney but so did NET73 St. John’s while NET33 NC State did not. #12S-Oregon’s upset of #9MW-Washington in the Pac 12 final likely sent UNC Greensboro (60NET) home. The ACC and SEC got 7 teams in with the Big 12 (6), AAC (4), Big East (4), and Pac 12 (3) getting at least three teams. The mid-majors managed to snag seven at-large bids (including the AAC’s 3) and almost a eighth (the aforementioned UNCG) in a nice change of pace. Somehow #9S-Oklahoma (7-12) and #11MW-Ohio St. (9-13) made the tourney with horrible losing conference records. No sign of UCLA or USC but the #13S-Anteaters of UC-Irvine made it to be our only local team, their 2nd appearance after making it in 2015 also as a 13 seed and nearly knocking off Louisville. #2E-Michigan St and #2W-Michigan (with the Spartans beating the Wolverines 3 times in 15 days) were both shipped to Hartford but Michigan St got Duke’s region due to the fact the regional (Washington DC) is much closer than their normal position as 5th seed in the West (Anaheim). #7S-Cincy gets to play in the same state (Columbus) with #4MW-Kansas hoping to make the regional in Kansas City. Streaking MW-Auburn who beat #2S-Tennessee for their first SEC title in 34 years only earned a 5 seed. Wow, the Selection show brought back memories of a simpler time when all picks were done in just over a half-hour, none of this NBA analyst nonsense of last year, none of the leaked brackets of the past, none of the dragging out the picks over an hour. And back on CBS where it belongs. While you decide who will win the tourney, for the 9th year I’m doing the HWCI NCAA First Four for Charity, where I will donate $2 per entry to a charity, this year to the Boys & Girls Clubs of America, which helps enable all young people, especially those who need us most, to reach their full potential as productive, caring, responsible citizens. This is one of the highest rated charities and since I have a son and daughter, this seems to fit. This First Four for Charity is free and you just have to submit (you can comment on this post to enter, email, post to Facebook, tweet @HWCI_Pools) who the four First Four winners will be and by what point margin. For example: Prairie View by 8, Belmont by 12, NC Central by 1, and Arizona St by 2. The four games are Fairleigh Dickinson vs Prairie View A&M, Belmont vs Temple, North Carolina Central vs North Dakota St, and Arizona St vs St. John’s. Get your entry by 3:40 pm PDT Tuesday. As a bonus, in the end, if we top our record of 178 entries this year, I’ll donate an additional $25. Also, invite your friends and people can enter (since it’s free) this charity contest but not our main pool.